Have you seen all of these white vinyl fences lately? For the last fifteen years, Florida has been the fasted growing vinyl fence market in the country, and the fence experts at All American Industries have been at the forefront in quality and design since the beginning. Vinyl fences are a beautiful and, most of all, affordable option for keeping you and your home protected. If you're in the market for quality vinyl fencing, give us a call. We have the experience and resources to provide a top-quality vinyl fence construction for your home or business. The beauty of vinyl fences is the low maintenance factor. If the fence becomes discolored because of mildew, dirt, or the like, all it takes is some soap, water, and a little elbow grease to make it look like new again. So, vinyl fencing will prove to be a low-cost fencing option through the years. Vinyl fences are also popular as an alternative to wood fences. They come in a wide range of heights and styles, as well as different grades of thickness. The style selections are numerous, and at All American Industries Fence, we have the ability to custom build any style that can be dreamed of and put on paper, helping you enjoy the most versatile fencing. Vinyl fencing's colors are also fresh and innovative. They come in basic colors such as white, almond, pebble stone, clay, and stone. And we even carry the wood grain look and wood textured styles as well. If its beauty and variety that you're looking for in your fencing, you can't go wrong with vinyl. Coming in so many colors, designs, and textures, vinyl fencing will provide all the customization you might ever want for your home. 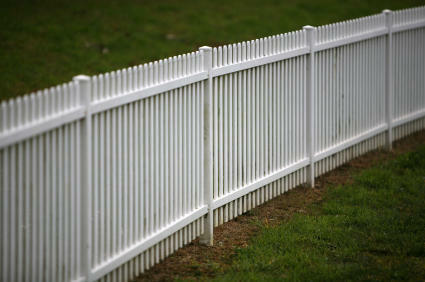 If you want a beautiful, top-quality vinyl fence, call All American Industries today. We have nearly 20 years of experience, and that experience combined with our promise to deliver quality work ensures that you'll get the best vinyl fencing if you call us for it.